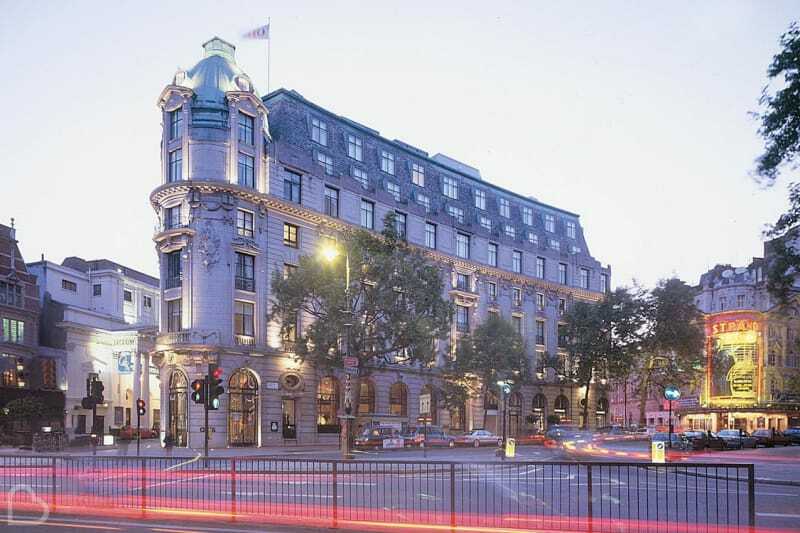 One Aldwych is a luxury 5-star boutique hotel and wedding venue situated in the heart of Covent Garden; one of London’s most vibrant and upmarket areas. 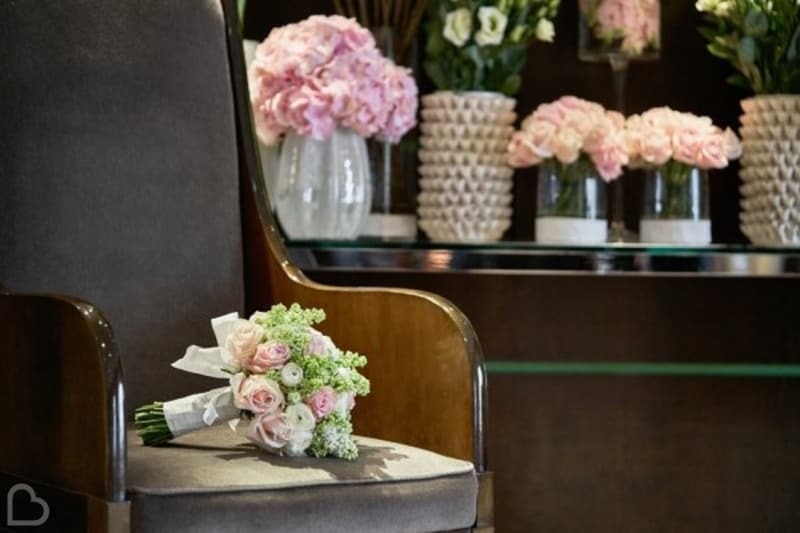 For those in search of a stylish city wedding at a venue bursting with history and character, and effortlessly exuding a sophisticated atmosphere and charm, One Aldwych could be The One for you. An architectural showstopper boasting breathtaking interiors adorned with fine art and exquisite ornamental design pieces, this wedding venue is something very special. 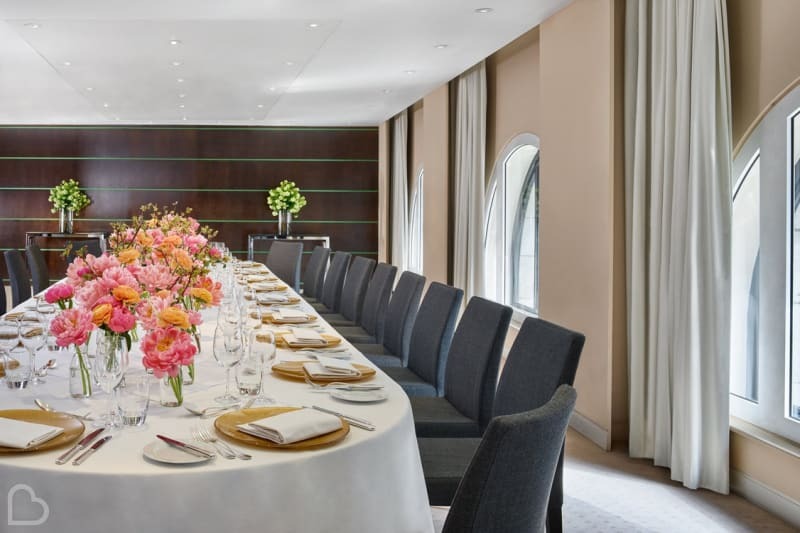 One Aldwych is best suited to couples who are really looking to go the extra mile and create an unforgettable wedding day that guests will be talking about for years to come. Step into the light and bright contemporary entrance hall and prepare to begin your journey – both in marriage and in the exploration of one of London’s most prestigious wedding venues. Invite your wedding guests to gather in the Lounge at One for welcome drinks, where contemporary artwork will undoubtedly make prevalent talking points. Allow guests time to peruse the collections whilst you finish getting ready in the elegant and stylish bridal suite. Take a breath; you’re about to marry the One in your picture perfect wedding venue in one of the most fabulous cities in the world. Take your final, ‘single person’ steps as you wind your way through the beautiful, art-adorned halls and corridors towards the Adelphi and Novello rooms; the most romantic setting in which to take your vows in front of family and friends. Surrounded by contemporary art and large windows, say “I do” in style against the backdrop of busy London life. Take each other’s hands and head over to Eneko at One to celebrate your nuptials in style – the hotel’s modern basque restaurant run by acclaimed, three Michelin-starred chef Eneko Atxa. This space is relaxed and inviting yet sophisticated; minimalist design prevails, and it feels distinctly ‘London’ through the achievement of a contemporary-cool atmosphere. In fact, this beautiful restaurant was recently awarded the ‘Best Restaurant or Bar Design 2017” at the annual Restaurant and Bar Design Awards 2017 for its innovative and modern design. 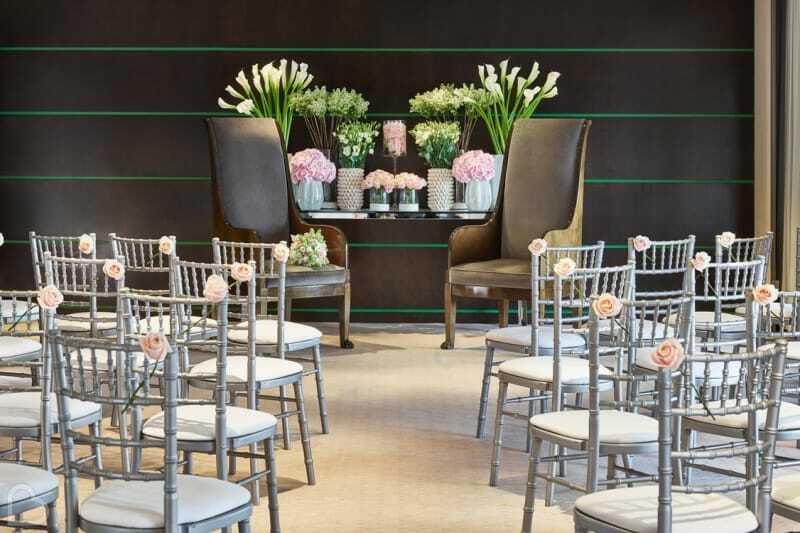 With the help of award-winning in-house florist, Mark Siredzuk, you’ll dress this contemporary space with bold floral arrangements that transform Eneko at One from restaurant to wedding venue in a floral flash. Marvel at the floating mezzanine wine bar as you sample a selection of wines from chef Eneko’s very own family winery near Bilbao; posing for photos and catching up with your guests. Available for exclusive hire and seating up to 110 guests, you’ll make your way to the exquisitely dressed tables and can sit back and relax knowing you’re about to experience some of the best food London has to offer. Your guests will be in awe as they enjoy Eneko Atxa’s Signature Menu to the sound of your chosen wedding music. Invite evening guests to join you (up to 150 guests in total) as the tables are abandoned in favour of the dance floor, and take a moment; look around and realise what you’ve achieved. A five star London wedding planned to perfection and executed flawlessly thanks to you, and the expert wedding planning team at One Aldwych. 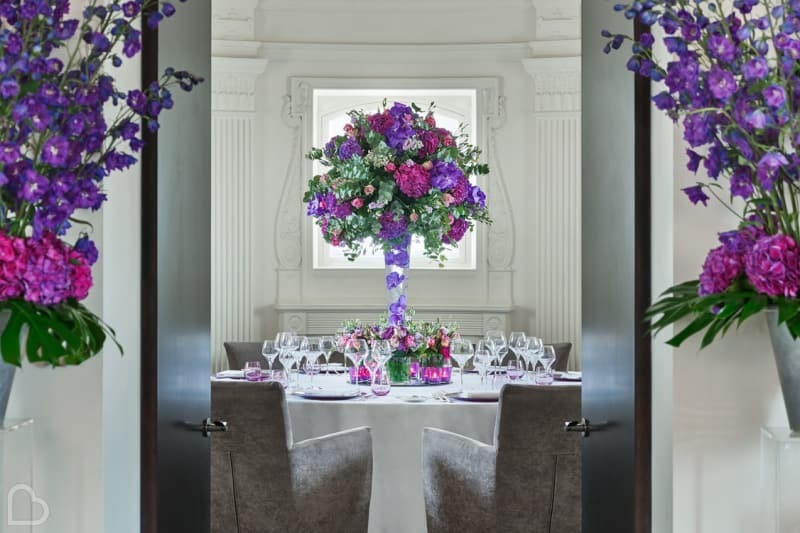 The dedicated events team at One Aldwych Hotel can help you plan as much or as little as you’d like for your special day. World-class chefs will work with you to build exceptional seasonal menus and they’ll ensure that you and all of your guests are taken care of – irrespective of dietary requirements. 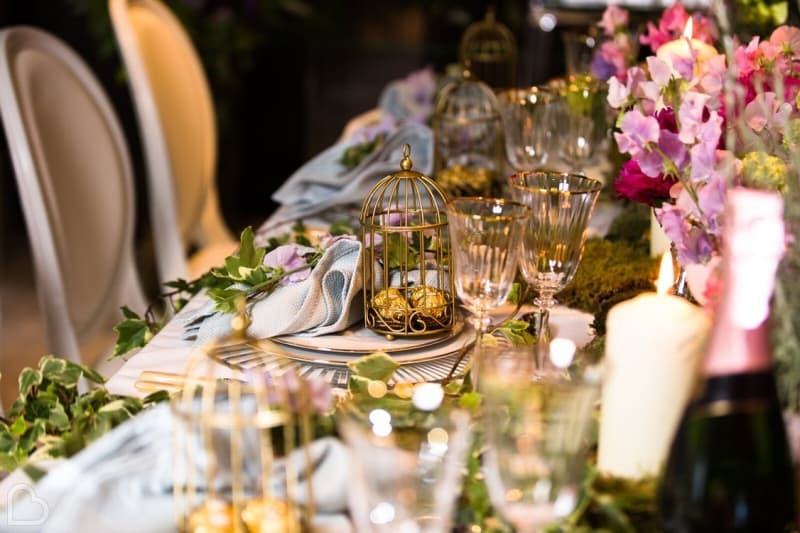 Award-winning in-house florist, Mark Siredzuk, is on hand to design beautiful bespoke floral arrangements that will really bring your wedding space to life. His pieces can be found throughout the hotel, within The Lobby Bar and in each of the hotel’s luxurious bedrooms. The Dome Suite – suitable for very intimate weddings only, The Dome Suite is an elegant, top floor sitting room with stunning rooftop views of London. It offers the option to seat 12 for a wedding breakfast or 25 for a wedding ceremony. The Lyceum Room – a contemporary space filled with beautiful artwork, ideal for an intimate wedding reception or wedding breakfast. One Aldwych makes for a truly spectacular London wedding venue. Is this The One for you? Find out more about One Aldwych on their Bridebook profile and start your wedding journey today.